I'm no longer a student, but my penchant for fashionable tote bags has yet to fade. Every girl needs that perfect carryall, the one with enough room to hold the limitless essentials while still looking like a million bucks. 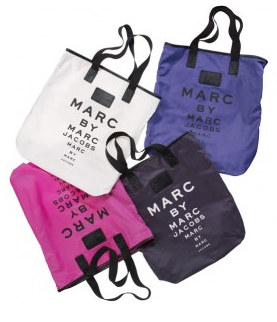 Thankfully, Canadian luxury retail giant Holt Renfrew has partnered with my label of choice, Marc by Marc Jacobs, to bring Canadians the ideal tote. For only $48, the classic totes are a definite steal. My eyes instantly gravitate between my go-to white, the never-out-of-style black and the girlie-girl hot pink. While I'll have to resist picking up a bag in each color, this working girl may have to splurge on two. Justifying my double purchase: a portion of the proceeds benefit Vision Spring, which improves vision in developing countries. Worried about missing out on the fashion steal of the season? Order yours online, starting September 7, here. Happy shopping!